Your data protection software should be as elastic as your enterprise. But, with data housed onsite, offsite, and in the cloud—and the challenges of meeting ever-shrinking backup windows and lowering the cost of storing growing volumes of data—can you confidently say that your data is always available when you need it? 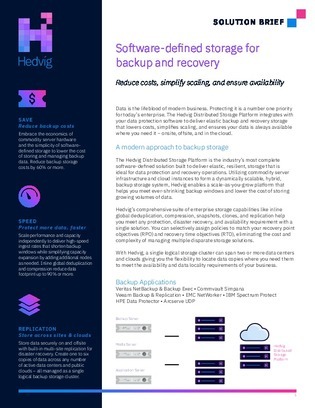 This resource outlines a software-defined storage system built to deliver elastic, resilient storage for backup and recovery operations. Download now to see how this system utilizes commodity server infrastructure and cloud instances to form a dynamically scalable, hybrid, backup storage system.